Bill O'Reilly is an American author, political commentator, syndicated columnist and television host. He wrote the book Killing Hannity and appeared on the front cover of it with Sean Hannity. 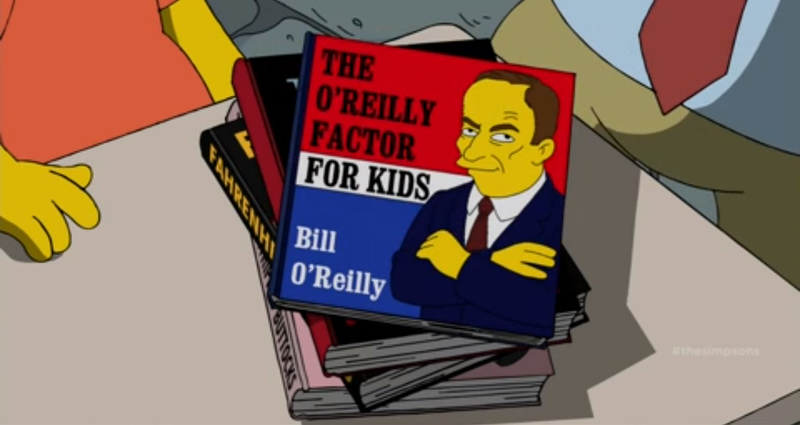 He wrote the book The O'Reilly Factor for Kids, which he also appeared on the front cover of. When Homer was addressing the audience live, Lisa held up a sign saying "We parked on Bill O'Reilly's spot". O'Reilly wrote the book Killing a Good Thing, which Donald Trump owns. Modified on April 27, 2017, at 14:23.